These virtual reality products provide the highest level of immersion in terms of virtual reality interactivity and 3D visualization. Using advanced technologies for projection, tracking, and interactive devices, VizTek engineers provide custom designs that fit your need and space requirements. Cyber-Anatomy Holographic®: individual dissection system. Typically purchased as a laboratory set of 12 units. Provides the highest level of personal immersion, learning, and interactivity. 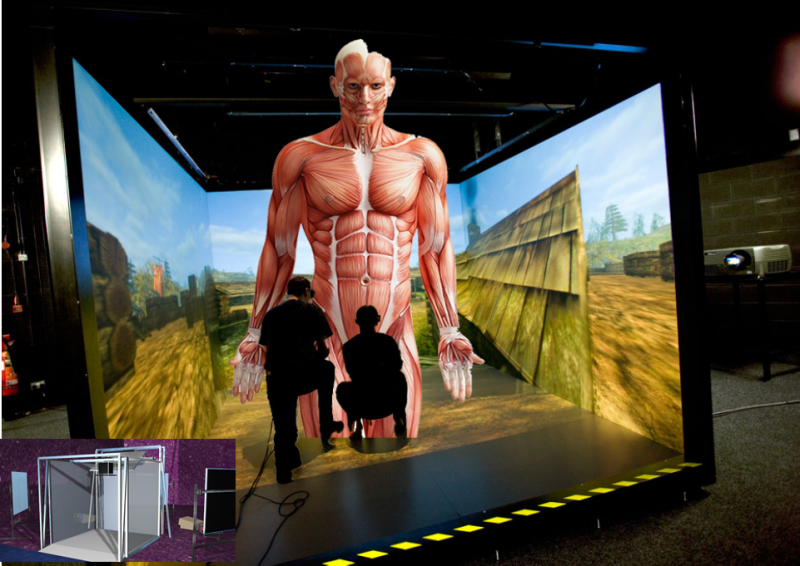 Built upon the innovative zSpace virtual reality system, this turnkey solution provides a unique WoW experience. 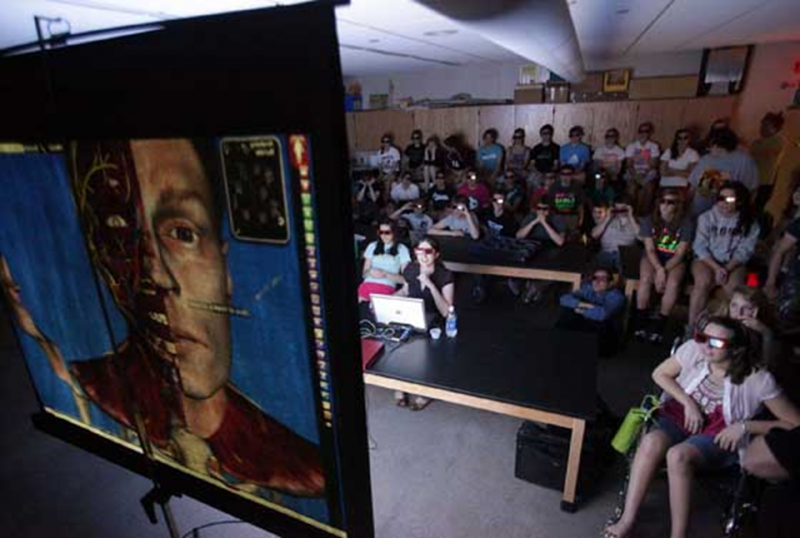 Cyber-Anatomy 3D-30: a turnkey virtual reality system for 30 students. 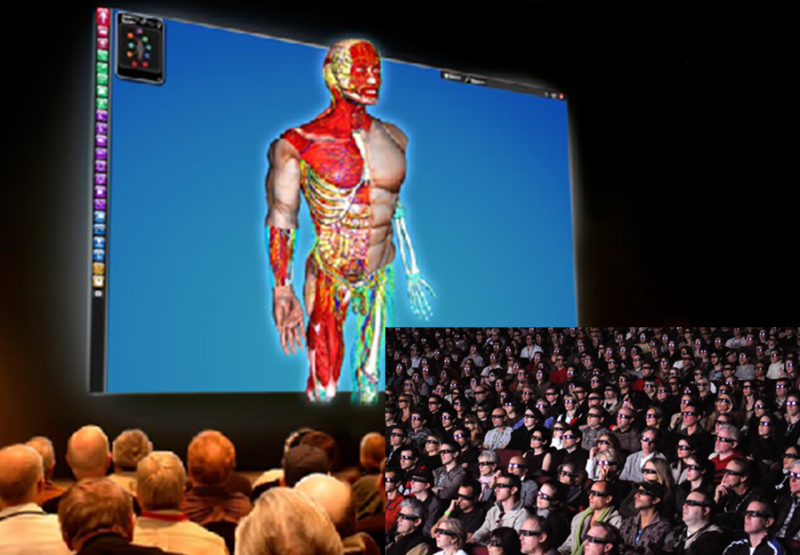 A large screen, active stereoscopic 3D classroom projection system. Head tracking technology provides a unique immersive experience as objects are visualized floating in front of the screen while the body moves. 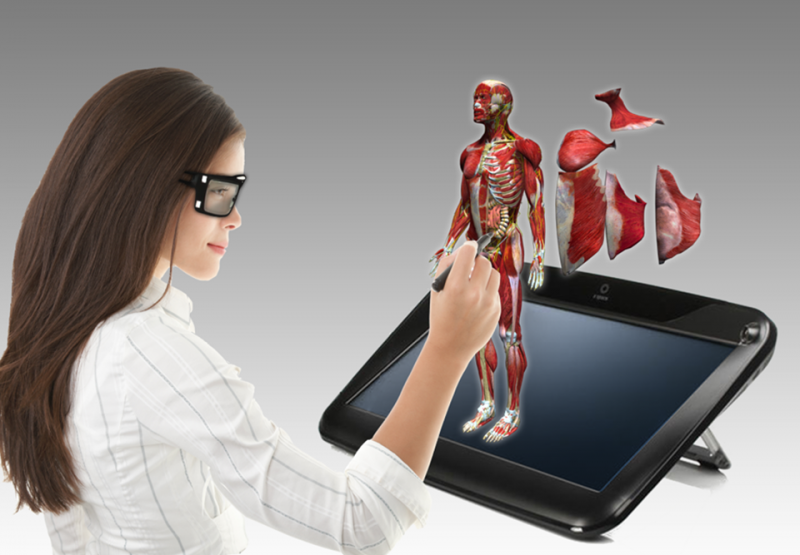 Cyber-Anatomy 3D-100: a turnkey virtual reality system for 100 students. A large screen, active stereoscopic projection for large classrooms. 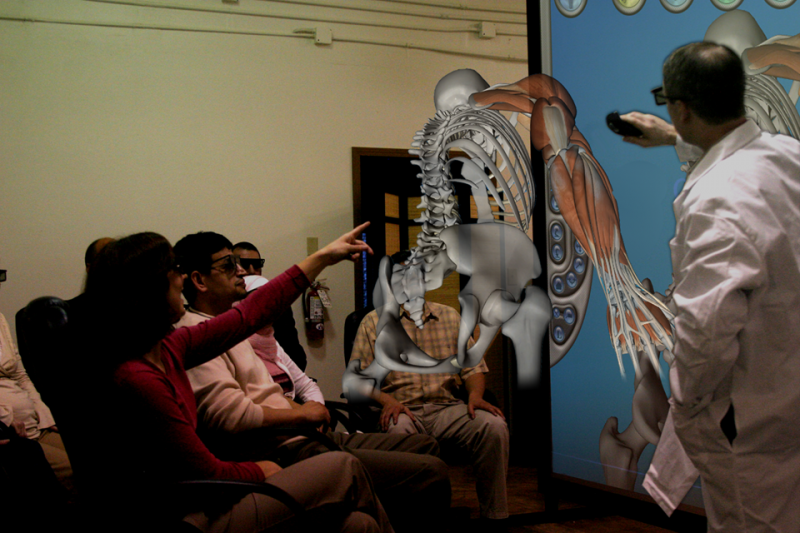 This extra large screen setup allows everyone in the room to experience anatomy instruction in 3D. Cyber-Anatomy 3D-Cube3: a turnkey 3-wall iCube (room setup) virtual reality system using full tracking to provide total immersion. The system provides active stereoscopic projection on 3 walls. Many observers can stand or are seated in front of the large scale presentation. Moreover, 5-7 people can be fully immersed by standing inside the Cube for scientific research visualization and interactivity. 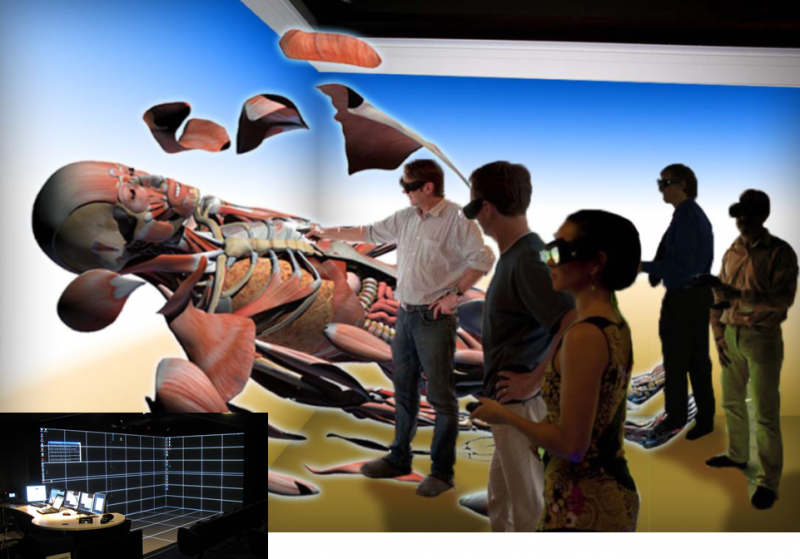 Cyber-Anatomy –Cube4: a turnkey 4-wall iCube (room setup ) virtual reality system using full tracking to provide total immersion. The system provides active stereoscopic projection on 4 screens, including the floor. Objects such as the human body will appear completely floating in space, whereby users are able to rotate around the objects, visualize each minute detail, and dissect each anatomical structure by peeling it off the body. Cyber-Anatomy Puppeteer: an innovative system for tracking the human body in real-time, allowing students to see muscles move and contract. 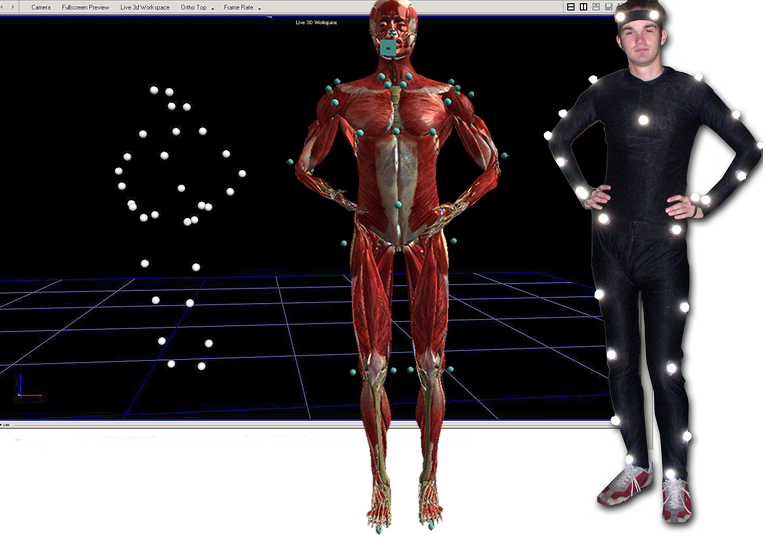 A user wears a motion capture suit and performs tasks (such as kicking a football), allowing students to observe dynamic musculoskeletal system motion. The most sophisticated system of its kind!